Christy Wright has unlocked the answer to the question we're all dying to know: How can we make money doing what we love? 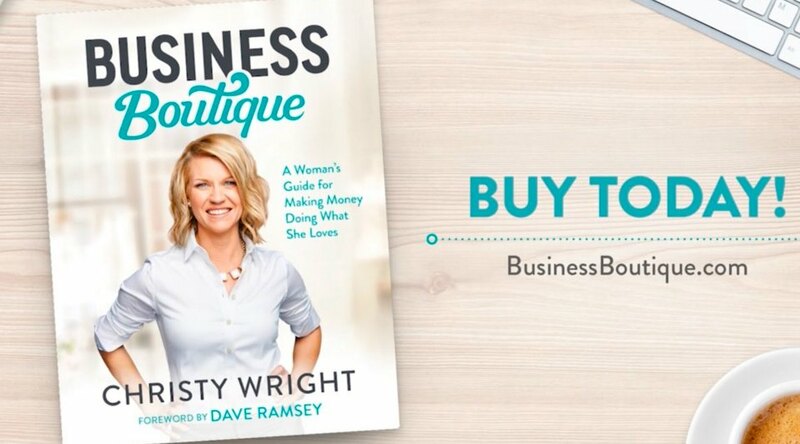 In Christy's book, Business Boutique: A Woman's Guide for Making Money Doing What She Loves, she uncovers a step-by-step, customized plan to take those ideas from our dreams into our everyday actions. There is a movement of women stepping into their God-given gifts to make money doing what they love, and this handbook allows all of us to join the party. Taxes? No problem. Marketing? Piece of cake. As women, we can be as successful as we want (as long as God's in it!). We just need to know how to do it correctly! Milk & Honey Magazine was lucky to interview Christy just a month before her 3-day women's conference in Nashville from November 2-4, 2017. We will be there! Will you? What sparked your desire to write the book? Growing up, I saw my mom run a successful business from the ground up. After seeing such a great example of entrepreneurship, I knew I wanted to start my own business. So when I saw an ad in the paper for a 40-acre farm for rent, I saw it as a gateway to the life I had always wanted. It included an 11-stall barn where I knew I could start a business boarding horses. I didn’t have anyone to instruct or guide me. There were no book to read on the subject at the time. I didn’t know what I was doing, but like many of the women I now coach, I made it up as I went! That’s why I wanted to write Business Boutique. I want to help women like me, women like my mom, and women like you! It’s a powerful thing to see women step into their God-given gifts. I wanted this book to help create a movement of women making money doing what they love. There’s never been a better time to start a business – all you need is an idea and a Facebook page. The risk is low, the cost is low and the opportunity is limitless. Don’t wait for everything to be perfect or for you to feel ready. Just go for it. Try something and see what works. You’re going to learn the most by doing so get out there and get moving! Advice for young women who want to "take the plunge" and turn their passion into business? Start with your story to develop your personal version of success. I like to call it finding your “why.” When times become hard, and it’s difficult to keep going, the passion behind what you do will continue to motivate you to work through. Stories are also what stick with people and will encourage your customers to find connections in the why of what you do. By sharing your heart, you will make draw people in naturally without having to be pushy in sales. In the beginning stages, it’s also important to lean into family and friends for support. No one is a self-made man. Success starts in community. You are a result of the people who have poured into you, loved you, taught you and led you well. When I started leaning into and leveraging the wonderful relationships around me, I realized that we are all a success together. I would encourage you to surround yourself with great people that are smarter than you, wiser than you, braver than you with more experience than you, and allow them to speak into your life. Common mistakes women make starting a business? Most new business owners make it up as they go and they don’t have a plan. I’ve found in my research that it’s not having too many things to do that overwhelms us, it’s not knowing what to do. You need to know what to do and what order to do it in. You need steps. You need a plan. When you do a little of the planning work on the front end, you not only save yourself headaches and mistakes, but you’re much more likely to be successful. My faith is very important to me! God has orchestrated so much of my story, but when I look back, I’m totally amazed by how my job has formed into what it is. It’s a total God thing, no doubt. Every day, I am blessed to be able to align my passion and the talents that He has given me, and I’m so grateful! The Bible verse that has stuck with me the most throughout life is from 1 Timothy 6:6 “But godliness with contentment is great gain.” I love this verse because it reminds me that true happiness and joy comes from being content with all the blessings God has given me. Keep working hard and doing the right thing. God cares more about who you’re becoming than where you’re going. God is weaving everything together – even the really difficult things that you don’t understand right now – for your good. How can women feel more confident? Take comfort in the fact that fear is normal. Researchers believe up to 70 percent of people (women, more often than men) suffer from the Imposter Syndrome – from the fear of not deserving your achievements or being “found out.” Even very successful people suffer from it. For example, Maya Angelou is quoted as saying, “I’ve written 11 books and each time I think, ‘Uh oh, they’re going to find out now that I can’t do this.’” Fear isn’t a sign your doing something bad, it’s a sign you’re doing something bold! Take the first step. For example, if you want to start a fitness coaching business, don’t get overwhelmed with everything you have to do to “launch” it. Just help one client. As you take one baby step after another, each step gives you confidence and fuels the next step. Eventually, one tiny step at a time, you have your business. Do it scared! Don’t wait until you’re ready, certain or perfect. Those feelings may never come. Put yourself out there anyway. Don’t wait until you’re not scared to do the thing you want to do.